We are currently fully booked. Please check-in next season. 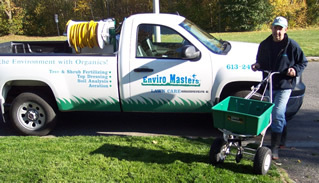 For over 20 years, Enviro Masters has proudly specialized in Organic & Enviro Considerate programs for communities everywhere! We take great pride in customizing programs according to the soil, weed, and grass types, providing each lawn with its specific needs. Unlike other programs, we start with the foundation for every great healthy lawn, the soil. Enviro Masters specially developed programs increase and regenerate the microbial activity in the soil. This is the first step to a long-term healthy lawn, which is able to stand alone, free of chemical dependence.